Phone not charging after Android 9 Pie upgrade: What to do? Xiaomi extends its praised flagship line of smartphones with the new Mi 9. The phone is a beast by all today’s performance standards. It upgrades an already powerful set of specs with the latest Snapdragon 855, and 8GB of RAM, delivering a package that’s tough to beat. Both performance-wise, and value-wise. That makes it more difficult for us to find any weaknesses of the Xiaomi Mi 9. And on paper, it doesn’t really have any actual flaws. It all comes down to whether you like certain features (like EMUI) or design of the phone or not. But in real-life use, users have encountered certain problems. And we’re here to report them and offer solutions for some. So, if you’ve encountered any of the following issues with your Mi 9, I hope you’ll find a viable workaround here. Note: All the issues mentioned in this article are individually reported cases, which doesn’t mean any of the problems will occur on other devices. If you’re looking to buy this phone,DON’T take these problems into consideration. One user reported a rather strange issue with wireless charging. Namely, when the phone is connected to a wireless charger in the car, it goes up to 100% and then turns on the screen automatically and stops charging. When the battery percentage drops to 99%, it starts charging again, and the pattern repeats. Right now, there’s no known solution for this issue. At least software-wise. The only thing you can try is getting another wireless charging. And even then, it’s not guaranteed that the problem will vanish, so you might end up buying a new charger for nothing. We still don’t know anything else about this problem, so we’re still waiting for an update on the situation. A lot of users have been reporting that the face unlock feature doesn’t work for them, even if they have the Global version of the phone. This is not an issue per se, because the face unlocking feature is available only in certain regions were the Xiaomi Mi 9 was officially launched. That’s why users in India, China, Spain, Italy, France, etc. can use the face unlock, while users in the Netherlands, for example, can’t. If you want to use the feature outside of the officially supported regions, you can always change your Region on the phone, but I’m not sure for how long will you be able to go like that. You should also keep in mind that changing the region to India, for example, will also install some additional apps, so you’ll have to deal with more bloatware. One user reported that all of his widgets on the Lock Screen show Chinese text. This ‘problem’ is not exclusive to the Mi 9, as it commonly occurs on the Xiaomi smartphones. While I don’t know the cause of this exact problem, there are a few solutions. And the most common solution is to download another Theme, because most of the themes in the Theme Market were made by Chinese developers, so it’s relatively easy to end up with a Chinese theme. Another solution people recommend is flashing another ROM, which is a more radical solution, but you can try it if the Chinese text sticks. One of the most common problems of the notches is space. You simply don’t have enough space on a screen with a big notch for both clock and notifications. That’s the case with the Poco F1, Mi 8, and numerous other smartphones. That’s why a notification icon briefly appears for a few seconds, and then disappears behind the clock. However, all these phones have big notches, which isn’t the case with the Mi 9. As the Mi 9 features a teardrop notch, there is enough space for both notifications and the clock. Users suspect that the development team simply copied the based system for the Mi 9 from the Poco F1 or Mi 8, and that’s why the notification icons disappear on this smartphone, as well. Right now, there’s nothing you can really do about it. But Xiaomi will likely release a system update that will fix this issue. So, just be patient. One user reported that games on his Mi 9 take too long to load. As you know, the Mi 9 boasts the most powerful Snapdragon CPU to date, so this isn’t a normal behavior. Right now, there’s no known solution for this issue. Of course, you can free up the RAM, but I doubt it will help. If anybody knows something more about this issue, please let us know in the comments below. Users usually complain about WiFi not working, but we have the opposite case here. Namely, one user said that he can’t turn off the WiFi connection, even though he only uses 4G. 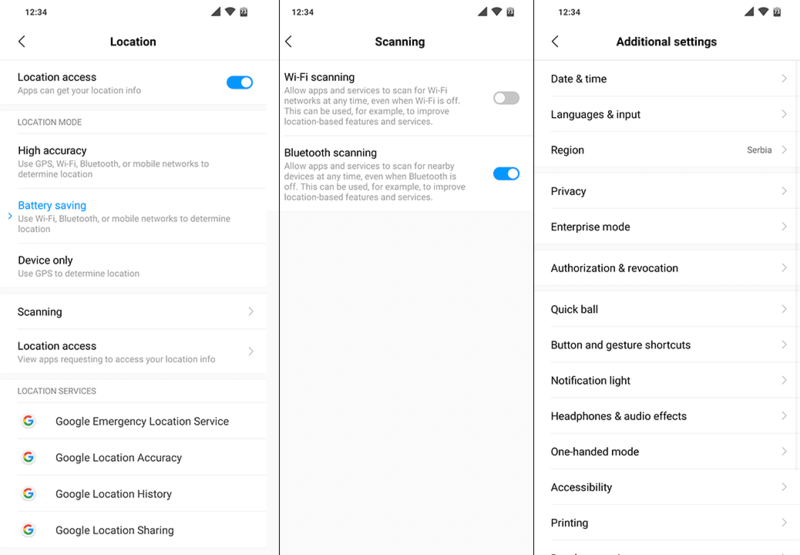 So, if you’re facing the same issue, the workaround for this problem is simple, as you just need to turn off the WiFi Scanning, and the phone won’t connect to WiFi automatically anymore. Under System & Device, tap Additional Settings. Go to Privacy > Location > Scanning. That’s about it, as you can see, there aren’t as many reported issues with the Xiaomi Mi 9 as there were with some other devices. However, the Mi 9 is still relatively ‘young’, which means more issues are likely to appear soon. If you’ve encountered a problem I didn’t list here, feel free to write it down in the comments below. Note: Each issue mentioned in this article is also on the XDA Forums, so you can the issue thread for more updates. Get to know your phone! If you just learned something new about your phone, and want more of that, subscribe to our newsletter. We guarantee 100% privacy. Your name/email address will never be shared. Camera not working after upgrading to Android Pie? Here’s what to do!